The Autumn Tests kick-off in November as Scotland get their final preparations for the 2019 Rugby World Cup in Japan underway – and Apex will be offering pitch perfect accommodation throughout. The national side will face Fiji, South Africa and Argentina at Murrayfield, and as with all of Scotland’s home games, Edinburgh comes alive for the big match. Apex has your stay in the Scottish capital covered, with four locations – centrally located Apex City of Edinburgh Hotel, the stunning castle views at Apex Grassmarket Hotel, or Apex Waterloo Place Hotel but for if you’re coming to the city for the Autumn Tests rugby, Apex Haymarket is the place to go. 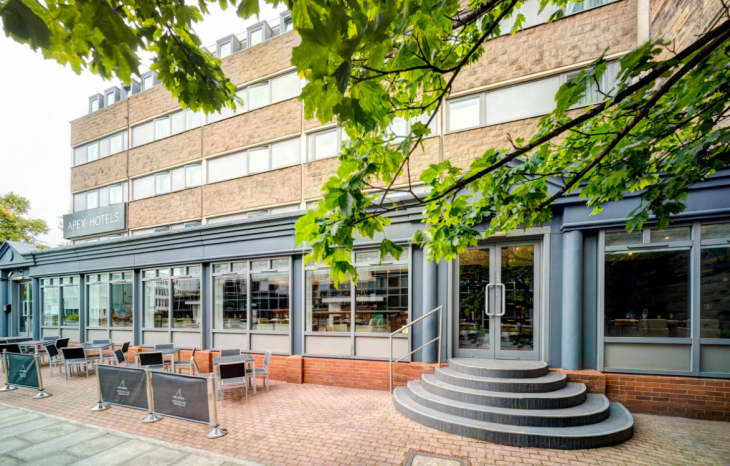 Less than a mile from the home of Scottish Rugby, the BT Murrayfield Stadium, Apex Haymarket is one of the best located hotels for fans looking to catch the Autumn Test action. The Murrayfield home crowd are a sight to behold as they throng their way past our hotel on the way to the stadium. A firm favourite of Scotland fans looking to catch the big match, Apex Haymarket is within convenient reach of Haymarket train station, tram stop, numerous bus and frequent 24-hour airport links. Being so close to Murrayfield also puts visiting fans within easy reach of some of the best rugby pubs Edinburgh has to offer. Read about some of our top picks here. The hotel’s own Metro West End Bar and Restaurant is a winner among the hotels near Murrayfield. The street-facing café, restaurant and bar is perfect spot for a big match warm-up as fans grab a bite to eat whilst watching the kilted masses making their way to the game. An all-day menu featuring fantastic food and drinks means there is something for everyone. Apex Haymarket also benefits from our trademark warmer welcome. The rooms are perfectly designed to maximise space and feature a 42”inch LCD TV, complimentary Wi-Fi and luxury Elemis toiletries.